Just a thank you from me as well to everyone for making it a great weekend. 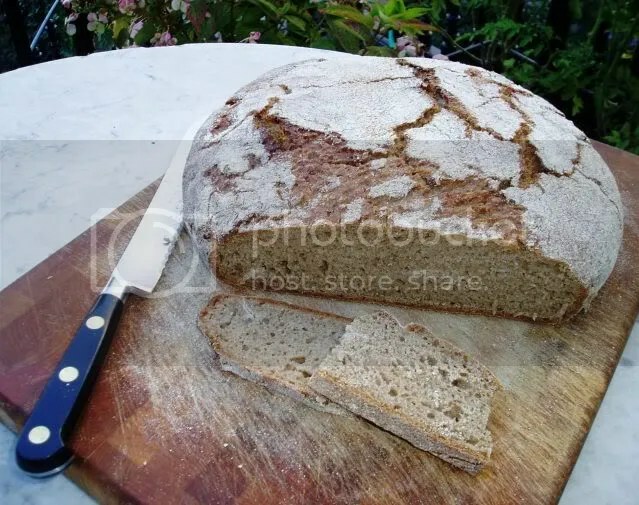 I have tried some new things already such as the “old bread” idea in naturally leavened bread suggested by Zeb which worked well. Inspired by Mick and Zeb’s efforts with making this rye bread I had a go myself. It’s the one where you pour over 46 c water over the sourdough and rye flour. This brings the mixture down to 37 c. The crumb was still sticky though after resting for 24 hours but tasted very good. I used two thirds wholemeal rye and a third white flour. Thanks Zeb. Was about to do that. Hope not interfering, I don’t know how familiar everyone is with the wordpress dashboard. Anyway that is a beautiful loaf Ben! Did you like the taste? It should then be ideal for sandwiches on the train up to the DDD! It was a good flavour though perhaps not as “fruity” as some other rye breads I’ve made. The process reminds me of the detmolder method with two different temperature ranges. I’m looking forward to coming to the Dales Dough Do! Last Saturday was like a dress rehearsal: I had three doughs on the go and spent most of the day on my feet. I had previously made Dan Lepard’s Italian flat bread from the HML and was really pleased with th results but tried it again without yeast. I think I preferred it with yeast as it had more flavour and melt-in-the -mouth consistency. The rye bread was messed up by forgetting to subtract the flour coming from the sourdough so had to add more water but it was still too dry. I also made up my standard naturally leavened bread.